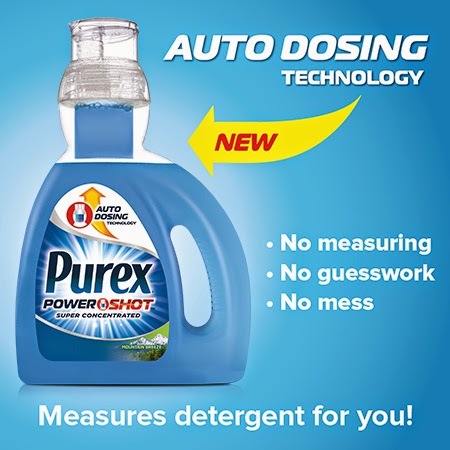 Purex is always coming up with innovative products. Their new PowerShot is no exception. This easy measure liquid detergent instantly gives you the correct amount that is right for your laundry load. Flip the no-spill detergent bottle once for regular loads and two flips for large or extra dirty loads. The built in auto-dosing technology gives you the exact amount. So no guesswork and no wasting detergent. Most of all there is no mess. The super concentrated formula has 50% more stain fighting power in every drop. It comes in two great scents - Mountain Breeze and Natural Elements Linen & Lilies. I received the Mountain Breeze scent to test out. It was simple for me to get the right dose of Purex PowerShot. It really made it much easier for me to do my laundry. The scent is really good and of course with Purex, you know you get the cleanest laundry since it has such great stain fighting power. I highly recommend this product to anyone who wants to take the guesswork out of measuring your liquid detergent. 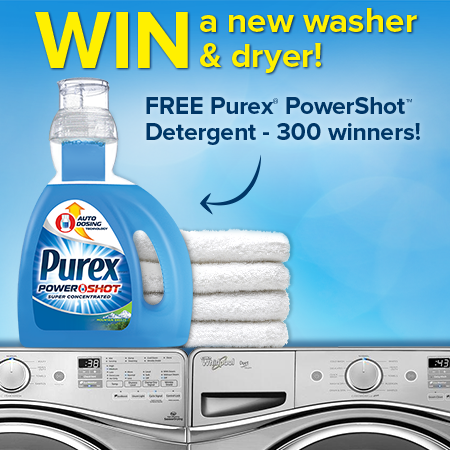 detergent, Purex will be hosting an amazing giveaway!